The PhoneTree MD is our most popular patient notification system. The PhoneTree MD is specifically designed for practices with as many as 7 providers. 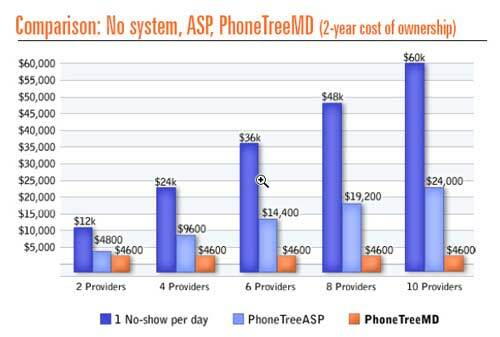 The PhoneTree MD provides an economical way for cutting down on your patients' no-shows - by as much as eighty percent! busy professionals - doctors, lawyer, attorneys, chiropractors and others having many clients or patients and busy schedules. PhoneTree MD provides the easiest way for reducing or eliminating no-shows, which with PhoneTree MD, can be cut as much as 80%. 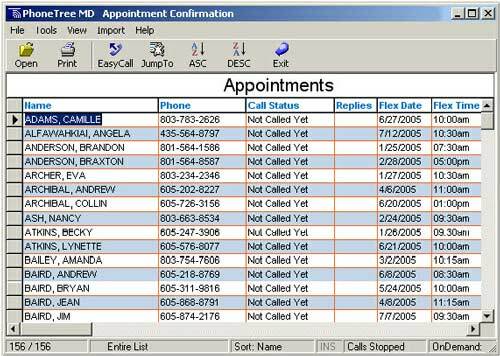 A polite reminder from the MD system (with optional confirmation) can keep your flow and clients and patients running smoothly and save your staff countless hours attempting to make contact prior to appointments. With the PhoneTree MD you can let your patients know when you won't be available for them. One of the greatest areas of dissatisfaction for people you serve is not being there for them when they expect you to be. Doctors frequently have emergencies or situations that can't wait - it's part of the profession. With the PhoneTree MD, as soon as you're aware of a situation that will keep you away from your scheduled appointments, you can automatically dial the effected patients quickly, and with a minimum of effort. Your messages can even include the appointment times and names of those you'll call. Your staff will no longer be burdened. PhoneTree MD can be configured to support everything from one person practices to multi-practice/multi-specialty organizations. And for practices with multiple individuals, unique messages can be tailored for each individual. You'll be able to individualize functions such as call transferring, message scripting, touch-tone responses and a host of other automatic dialing functions. PhoneTree MD can deliver messages to patients with delinquent accounts. You can ask patients to reschedule after inclement weather or you can let them know when they are due for flu shots, other immunizations, screenings and regular check-ups. 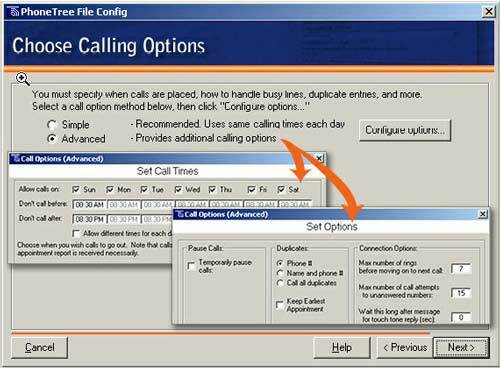 PhoneTree supports multiple calling sessions, providers and locations - delivering unique messages to each patient. And the PhoneTree MD you'll deliver your messages with crystal-clear 16 bit sound. Listen to some of our in-use examples directly below. You'll be able to interface Phone Tree MD with one of your existing computers. It will easily connect with your already installed data processing resources through one of the systems' USB ports. All you'll need is a computer running Windows 98, 2000, XP or Vista. All PhoneTree MD systems are warranted for one full year on all hardware and software components, and our bundled package gives users a full year of support. Extended service contracts are available - speak to your sales representative for pricing. Also, PhoneTree MD is designed for remote servicing. Same day service is available for most issues during the hours of 8:00 am to 5:00 PM EST. Email support is available as well. Generally, emailed responses are returned the same day.